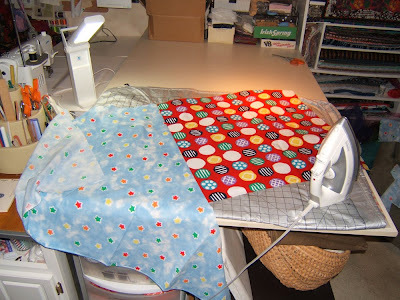 Making the back for this cuddle quilt is what prompted me to clear the work table. 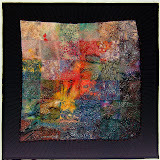 The quilt is destined as a gift for a new great-nephew after being exhibited in this years Smoky Mountain Quilt Guild show in March. 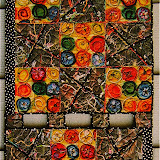 Follow the Yellow Brick Road - 53"x 53"
It's designed to be a story telling quilt. Pick a square to begin, "Once upon a time…" Then follow the yellow brick road to another block for a clue to tell the next part of your story. Continue following segments of the yellow brick road to get to "the end". I like to make pieced backings. One of my favorite ways features a big diamond in the center. 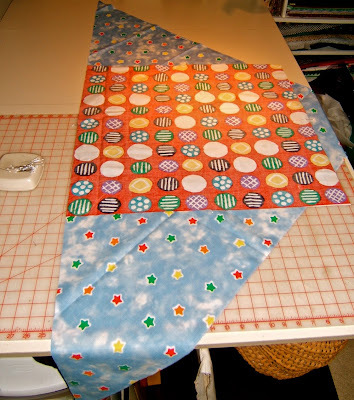 I begin by cutting a square from my chosen fabric. The size of it usually depends on the amount that I have. 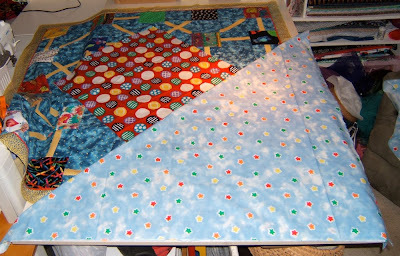 To figure out the pieces for the backing I begin by positioning that large square on the diagonal in the center of the quilt top. The next step is to figure out which fabric and how much is required to fill the corners. I have no mathematics for this. 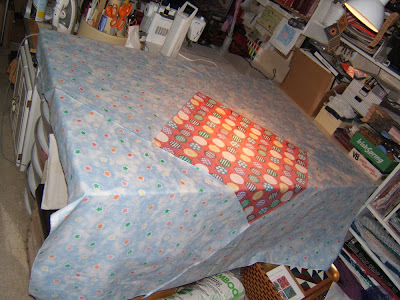 I position pieces of fabric over the areas of my quilt top to make sure they're large enough. 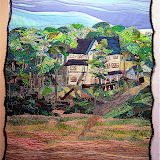 For this quilt there were yards of the star fabric that I chose for these corners. I determined that a half-square measured by folding the width of the fabric on the diagonal would cover a corner. I had enough yardage that I could cut two big squares to get four triangles. 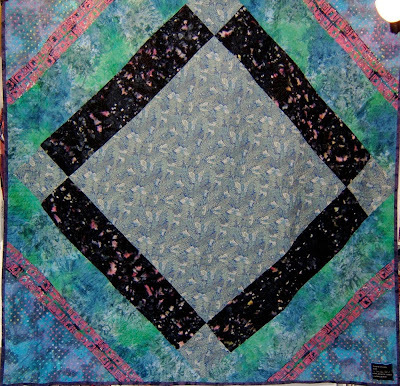 Note that the straight of the fabric grain on that triangle lies on the outside edge of the quilt. 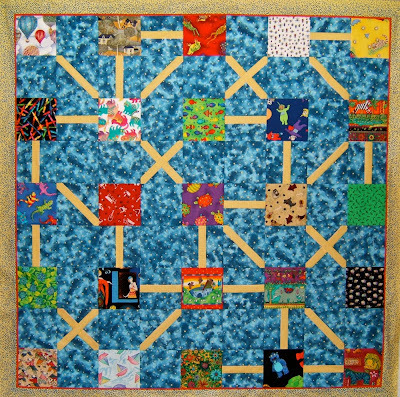 To begin assembly of the quilt back, align the centers of the middle square and a triangle shaped corner. Pin the edges together taking care not the stretch that bias edge of the triangle. Sew them together ending the seam 1/4" in from the edge of the middle square. After stitching the seam, cut away one small triangle corner of fabric that extends beyond the edge of the middle square. Then press the seam so it extends away from the middle of the quilt. 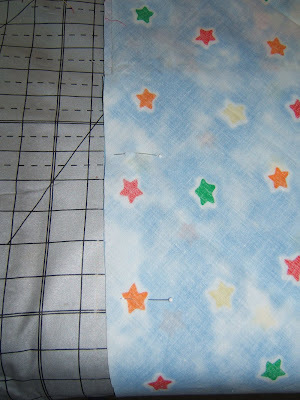 Sew the adjacent corner piece to the middle square and the newly cut straight edge of the first corner. Cut off the small triangle from this second corner fabric that extends beyond the middle square and press the seam. 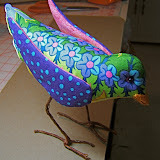 Do the same with the next adjacent corner ... sew, cut away small triangle, and press. Sew the fourth corner to the middle square and the third corner piece. Cut away the excess small triangle. That cut edge will be even with the cut edge of the middle square. Match the edge of the fourth corner to that of the first corner to complete that partial first seam. 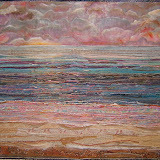 Here is my completed quilt back. 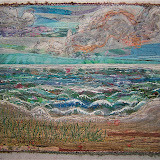 I usually work from my stash and many times the fabric I want to use is a limited quantity so I play with the layouts. 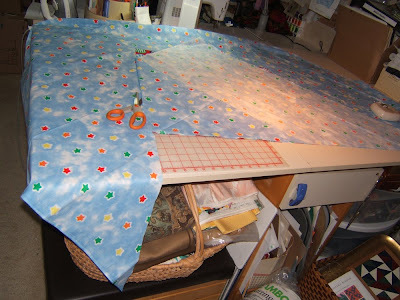 Many times those corner areas are pieced because there's not enough of one fabric to fill that area. 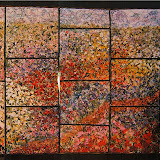 The quilt back pictured below is made of linen fabrics. 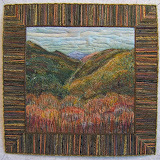 I had a great big piece of the center square and a much smaller piece of the fabric used in the corners. White linen was used to fill in gaps. 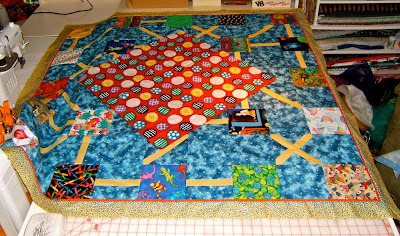 Again, I determined the layout by laying all the pieces out on my quilt top to make sure there was enough to do the same design in all four corners. I don't recall if this back is more complex by design or if my yardage was limited. All I know is that it suited the bed-size quilt it's made for. 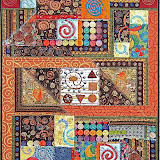 A delightful quilt Nellie and a free tutorial thrown in. That's real value for money!! 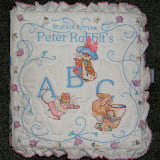 Any child would love this quilt and be cheered by it's patterns and lovely colours. The parents will be grateful for the storytelling prompts too! I love that colorful quilt! And thanks for the lesson on how to do the backing. I'm going to bookmark this one. 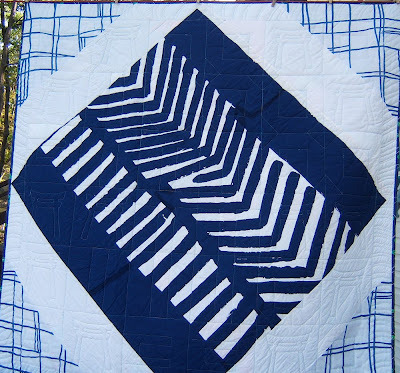 That's a really super idea for a child's quilt--I'm going to remember it! 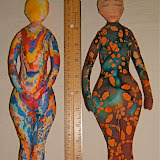 I love pieced backings and yours is so clever!!! Thanks so much for sharing this neat idea. I can't wait to try it!